2004 Haas TL-2 CNC Tool Room Lathe s/n 67326 w/ Haas Controls, Tailstock, Rigid Tapping, M19 Spindle Orientation P & R Codes, Quick Code, Dorian Tool Post, 10” 3-Jaw Chuck. 2003 Haas TL-1 CNC Tool Room Lathe s/n 66812 w/ Haas Controls, Tailstock, 5C Collet Closer, Dorian Tool Post. Mori Seiki SL-35B CNC Turning Center s/n 1106 w/ Fanuc MF-T6 Controls, 10-Station Turret, Hydraulic Tailstock, 12” 3-Jaw Power Chuck, Chip Conveyor, Coolant, LNS Hydrobar Hydraulic Bar Feed. 1998 Amera-Seiki TC-4LS Twin Spindle CNC Turning Center s/n 79341 w/ Fanuc Series 0-T Controls, Tool Presetter, 12-Station Turret (Double Sided), S26 Collet Pad Noses on Main and Sub Spindles, Part Chute, Chip Conveyor, Coolant, LNS Hydrobar 7-Tube Hydraulic Bar Feed. 1994 Amera-Seiki TC-4LS Twin Spindle CNC Turning Center s/n 79102 w/ Fanuc Series 0-T Controls, Tool Presetter, 12-Station Turret (Double Sided), S26 Collet Pad Noses on Main and Sub Spindles, Part Chute, Chip Conveyor, Coolant, LNS Hydrobar 7-Tube Hydraulic Bar Feed. 1996 Tong-Tai / Galaxy Quasar-250 CNC Turning Center s/n 7025 w/ Fanuc Series 0-T Controls, 12-Station Turret, Tailstock, S20 Collet Pad Nose, Coolant, LNS Hydrobar 6-Tube Hydraulic Bar Feed. 1995 Tong-Tai / Galaxy Quasar-250 CNC Turning Center s/n 6588 w/ Fanuc Series 0-T Controls, Tool Presetter, 12-Station Turret, Tailstock,S20 Collet Pad Nose, Chip Conveyor, Coolant, LNS Hydrobar-Tube Hydraulic Bar Feed. Mori Seiki SL-2B CNC Turning Center s/n 1362 w/ Fanuc System 6T Controls, 10-Station Turret, Riken Colleted Spindle, Part Chute, Chip Conveyor, Coolant, LNS 6.65-HS-5.2 6-Tube Hydraulic Bar Feed. Mori Seiki SL-0H CNC Turning Center s/n 1096 w/ Fanuc System 10TE Controls, 8-Station Turret, 3J Collet Nose, Coolant, LNS Hydrobar 6.32-HLS5.2 6-Tube Hydraulic Bar Feed. Mori Seiki SL-0H CNC Turning Center s/n 1077 w/ Fanuc System 10TE Controls, 8-Station Turret, 3J Collet Nose, Chip Conveyor, Coolant, LNS Hydrobar 6-Tube Hydraulic Bar Feed. Omni-Turn Series II mdl. GT-75 CNC Cross-Slide Lathe w/ Omni-Turn 0T-CNC Controls, Pneumatic 5C Collet Closer, Coolant, CNC Enhancements Hydraulic Bar Feed. Hardinge / Omni-Turn CNC Cross-Slide Lathe w/ Omni-Turn 0T-CNC Controls, Pneumatic 5C Collet Closer, Coolant. 2006 Haas VF-2 4-Axis CNC Vertical Machining Center s/n 49402 w/ Haas Controls, 24-Station Side-Mount ATC, CAT-40 Taper Spindle, 7500 RPM, m19 Spindle Orientation P & R Codes, Brushless “A” Axis, Rigid Tapping, Coordinate Scaling and Rotation, Macros, Programmable Coolant Nozzle, Chip Auger, Floppy Disc, 14” x 36” Table, Coolant. 2005 Haas TM-1 Tool Room Vertical Machining Center s/n 40047 w/ Haas Controls, 10-Station ATC, CAT-40 Taper Spindle, 7500 RPM, 10 ½” x 41 ½” Table. Bridgeport Vertical Mill w/ Sony DRO, Speed-Rite Adjustable RPM, Power Feed, Bridgeport Shaper Head, 9” x 36” Table. Bridgeport Vertical Mill w/ Sony Programmable DRO, Speed-Rite Adjustable RPM, Power Feeds, 9” x 42” Table. Bridgeport Vertical Mill s/n 102012 w/ 89-2720 RPM, Power Feed, 9” x 36”Table. Enco mdl. 1005200 Knee Mill w/ 215-3440 RPM, 9-Speeds, R8 Spindle, 8” x 30” Table. Fritz Werner No. 2.211 Horizontal Mill w/ 58-1270 RPM, 40-Taper Spindle, Power Feeds, Arbor Support and Arbor, 11” x 43” Table. Whacheon HL435X1000G 17” x 42” Geared Head Gap Bed Lathe s/n 221965 w/ 32-1800 RPM, Inch Threading, Tailstock, Steady Rest, 8” 3-Jaw Chuck. Homestrand Machine “Homac” 15” x 52” Geared Head Gap Bed Lathe s/n 3425 w/ Inch Threading, Tailstock, 8” 3-Jaw Chuck. Cadillac mdl. 1442 14” x 42” Geared Head Gap Bed Lathe w/ 55-1800 RPM, Inch Threading, Tailstock, 5C Collet Closer, KDK Tool Post. Hardinge mdl. HC Hand Chucker s/n HC-7000-T w/ 125-3000 RPM, 8-Station Turret, Power Feeds, 5C Collet Closer, Coolant. Hardinge mdl. DSM-59 Narrow Bed Second OP Lathe s/n DV-59-8572 w/230-3000 RPM, 6-Station Turret, Cross-Slide, Cutoff Attachment, 5C Collet Closer, Coolant. Hardinge mdl. 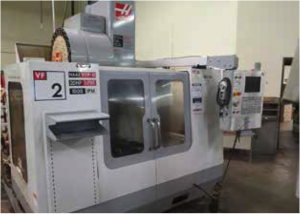 DV-59/DSM-59 Narrow Bed Second OP Lathe w/ 230-3000 RPM, 6-Station Turret, Cross-Slide, 5C Collet Closer, Coolant. Dunham / Dunhamate Series 2000 mdl. DL-2S-TS-PC Automatic Lathe s/n 1277-85-0 w/ Dual Pneumatic Cross Slides, 5C Collet Closer. Hardinge / Bradmatic Automatic Speed Lathe s/n HSL-5C-4666-T w/ Bradmatic Controls, Pneumatic 5C Collet Closer. Schaublin type 102-80 Second OP Lathe s/n 1527 w/ 6-Station Turret, 5C Collet Closer, Coolant. Levin type 003303 Jewelers Lathe s/n 3010847 w/ 6-Station Turret, Cross-Slide, 1A Spindle and Collets. 2009 SuperTec mdl. G32P-60CNC 12” x 24” CNC Cylindrical Grinder s/n GP07001 w/ Fanuc Series 0iMate-TC Controls, Sizing Arm, Hand Wheel, Coolant. 2009 SuperTec mdl. G38P-60NC 15” x 20” CNC Cylindrical Grinder s/n GC08016 w/ SuperTec Controls, Coolant. IGM Okamoto mdl. IGM-2M CNC ID Grinder s/n 11561 w/ Okamoto Controls, 6” 3-Jaw Chuck. Cincinnati No.2 Centerless Grinder s/n 2M2H1L-135 w/ Adjustable Taper Head, Hydraulic Wheel Dresser, Coolant. SuperTec mdl. STC-20 Centerless Grinder s/n C29503 w/ Adjustable Taper Head, Hydraulic Wheel Dresser, Coolant. KBC Centerless Grinder w/ Adjustable Taper Head, Hydraulic Wheel Dresser, Coolant. Brown & Sharp No.2G 1 ½” Cap. CNC Screw Machine s/n 14590 w/ Servo-Cam SC1000 CNC Controls, (3) Cross Slides, 6-Station Turret, Bar Feed, Coolant. Brown & Sharp No.2G 1 ½” Cap. CNC Screw Machine s/n 12008 w/ Servo-Cam SC1000 CNC Controls, (3) Cross Slides, 6-Station Turret, Bar Feed, Coolant. Brown & Sharp No.2G 1 ½” Cap. CNC Screw Machine s/n 11890 w/ Servo-Cam SC1000 CNC Controls, (3) Cross Slides, 6-Station Turret, Bar Feed, Coolant. Brown & Sharp No.2G 1 ½” Cap. CNC Screw Machine s/n 542-2-854 w/ Servo-Cam SC1000 CNC Controls, 3) Cross Slides, 6-Station Turret, Bar Feed, Coolant. Brown & Sharp No.2G 1 ½” Cap. CNC Screw Machine s/n 542-2-125 w/ Servo-Cam SC1000 CNC Controls, (3) Cross Slides, 6-Station Turret, Bar Feed, Coolant. Brown & Sharp No.00G Automatic Screw Machine s/n 15982 w/ (3) Cross Slides, 6-Station Turret, Bar Feed, Coolant. Brown & Sharp No.00 Automatic Screw Machine s/n 542-00-3681 w/ (3) Cross Slides, 6-Station Turret, Bar Feed, Coolant. 1997 Davenport mdl. B 5-Turret Automatic Screw Machine s/n 6774 (Rebuilt in 1997) w/ (5) Turrets, Cross Slides, Chip Auger, Sound Enclosure. 1974 Davenport mdl. B 5-Turret Automatic Screw Machine s/n 8437 w/ Threading Attachment, (5) Turrets, Cross Slides, Chip Auger, Sound Enclosure. 1969 Davenport mdl. B 5-Turret Automatic Screw Machine s/n 6515 w/ Threading Attachment, (5) Turrets, Cross Slides, Chip Auger, Sound Enclosure. 1969 Davenport mdl. B 5-Turret Automatic Screw Machine s/n 6514 w/ (5) Turrets, Cross Slides, Chip Auger, Sound Enclosure. 1964 Davenport mdl. B 5-Turret Automatic Screw Machine s/n 52844 w/ Threading Attachment, (5) Turrets, Cross Slides, Chip Auger, Sound Enclosure. Acme-Gridley mdl. RB-6 2” Cap 6-Turret Automatic Screw Machine s/n 41653 w/ Cross Slides, Slotting Attachment, Coolant. Acme-Gridley mdl. RB-6 1 5/8” Cap 6-Turret Automatic Screw Machine s/n 41925 w/ Cross Slides, Coolant. Acme-Gridley mdl. RA-6 1 5/8” Cap 6-Turret Automatic Screw Machine s/n 40930 w/ Cross Slides, Coolant. Acme-Gridley mdl. RA-6 1 5/8” Cap 6-Turret Automatic Screw Machine s/n 40738 w/ Cross Slides, Coolant. Acme-Gridley mdl. RA-6 1 ¼” Cap 6-Turret Automatic Screw Machine s/n 71623 w/ Pick-Off, Cross Slides, Coolant. Acme-Gridley mdl. RA-6 1 ¼” Cap 6-Turret Automatic Screw Machine s/n 71276 w/ Pick-Off, Cross Slides, Coolant. Acme-Gridley mdl. RA-6 1 ¼” Cap 6-Turret Automatic Screw Machine s/n 71436 w/ Cross Slides, Coolant. Hardinge mdl. DSM-59 Narrow Bed Second OP Lathe s/n DV-59-8572 w/ 230-3000 RPM, 6-Station Turret, Cross-Slide, Cutoff Attachment, 5C Collet Closer, Coolant. Sunnen Eclipse EC-3500 Automatic Honing Machine s/n 4V1-1681 w/ 200-3000 RPM, Auto Stroke Cycles, 6.6” Stroke Length, Auto Sizing, Coolant. Sunnen Eclipse EC-3500 Automatic Honing Machine s/n 3S1-1058 w/ 200-3000 RPM, Auto Stroke Cycles, 6.6” Stroke Length, Auto Sizing, Coolant. Sunnen Eclipse EC-3500 Automatic Honing Machine s/n 2T1-1204 w/ 200-3000 RPM, Auto Stroke Cycles, 6.6” Stroke Length, Auto Sizing, Coolant. Sunnen Eclipse EC-3500 Automatic Honing Machine s/n 2T1-1197 w/ 200-3000 RPM, Auto Stroke Cycles, 6.6” Stroke Length, Auto Sizing, Coolant. Sunnen Eclipse EC-3500 Automatic Honing Machine s/n 1R1-1015 w/ 200-3000 RPM, Auto Stroke Cycles, 6.6” Stroke Length, Auto Sizing, Coolant. Sunnen Eclipse EC-3500 Automatic Honing Machine s/n 1V1-1749 w/ 200-3000 RPM, Auto Stroke Cycles, 6.6” Stroke Length, Auto Sizing, Coolant (MISSING CONTROL CIRCUITS). Sunnen mdl. MBC-1802 Honing Machine s/n 83850 w/Power Stroking, Coolant. Sunnen mdl. MBC-1802 Honing Machine s/n 81821 w/Power Stroking, Coolant. Sunnen mdl. MBB-1660 Honing Machine s/n 88028. Sunnen mdl. MBB-1660 Honing Machine s/n 83868. Sunnen 3-Station Honing Bench w/ mdl. MBH-999K s/n 528, MBH-999C s/n 539, MBB-1600 s/n 40747 Honing Machines. Sunnen 3-Station Honing Bench w/ mdl. MBH-2500K s/n 130, MBH-2500C s/n 133, MBB-1600H s/n 44582 Honing Machines. Sunnen Eclipse EC-3500 Automatic Honing Machine s/n 1V1-1749 w/ 200-3000 RPM, Auto Stroke Cycles, 6.6” Stroke Length, Auto Sizing, Coolant (MISSING CONTROL CURCUITS). Sunnen mdl. MBC-1802 Honing Machine s/n 83850 w/ Power Stroking, Coolant. Sunnen mdl. MBC-1802 Honing Machine s/n 81821 w/ Power Stroking, Coolant. Denison Multipress mdl. A 2-Ton Hydraulic Press s/n 4151 w/ 9” x 11” Bolster Area. Air Hydraulics mdl. 545-5KS Hydraulic Press s/n 500 w/ 9” x 18 ½” Bolster Area. Benchmaster No.173 OBI Stamping Press s/n 181-63841 w/ 9” x 11” Bolster Area. Federal N0.2 OBI Turret Stamping Press w/ 10-Station Turret. DoAll mdl. C-3300NC 13” CNC Horizontal Hydraulic Miter Band Saw s/n 98275 w/ UniOP Controls, Hydraulic Clamping and Feeds, Miter Capability, Chip Auger, Conveyors, Coolant. Grob mdl. NS18 18” Vertical Band Saw s/n 6190 w/ Blade Welder. American Broach & Machine Co mdl. XA-175-D Vertical Hydraulic Broaching Machine s/n 4078 w/ 38” Stroke. Thermonic Induction Heating Machine w/ Superior Induction mdl. SI-25kW Induction Power Source s/n SI25kW0221. Egloff & Graper Electric Draw Oven. Beaver-Matic Gas Fired Steam Oven. (2)Wicaco Continuous Oil Groover Machines s/n’s 500-Z-4, 500-P-12. Hendley Machine Co “Gen-A-Cam” mdl. 71 Cam Forming Machine s/n 10569. Dry Rod Electrode Stabilization Oven s/n 475. Kwik-Way Cylindrical Cutoff Saw w/ Motorized Work Head, 5” 3-Jaw Chuck. Enerpac Bench Model Electric/Hydraulic H-Frame Press w/ Bench. Sever-It 12” Abrasive Cutoff Saw w/ Stand. (2)Pneumatic 3J 4-Station Collet Closers. 5C Indexing Heads and Collet Closers. Gun Drills and Sharpening Fixtures. Insert Drills, Spade Drills, Insert Turning and Boring Tooling and Carbide Inserts. Drills, Taps, Reamers and Perishable Tooling. Screw Machine Collets and Feed Fingers. Starrett and Brown & Sharp Super-Micrometers. Precision Carbide Plug and Ring Masters. Rockwell mdl. AR8 Rockwell Hardness Tester s/n 6487. Rockwell mdl. 3JS Rockwell Hardness Tester s/n 3JS-2244. Clark mdl. C500-80 8000 Lb Cap LPG Forklift s/n 685-292-2251-1072 w/ 2-Stage Mast, 147” Lift Height, Cushion Tires. Economy mdl. BC-2133-2W 21’ Electric Scissor Platform Lift s/n CK76963 w/ 900 Lb Cap, 24 Volt Charger. Cantilever Sheet Stock and Bar Stock Racks. Pallet Racking, Storage Shelving and Cabinets. Large Quantities of Raw Bar Stock including Stainless and Cold Rolled Steels. Large quantity of retail inventory from the “All American Products Group”, including drill bushings, work holding toggle clamps, mill clamps, locating pins, machine handles, “Ringmaster” gages, and much more.